Facebook/Caitlin OrantesKaiden Orantes listening to his mother’s voice with his new hearing aids. Kaiden Orantes broke into a dance when a new hearing aid helped him to hear his mother’s voice, ABC News reports. Kaiden, 2, was born with normal hearing but was diagnosed with progressive hearing loss earlier this year. Doctors still aren’t sure why his hearing has worsened, Kaiden’s mother, Caitlin Orantes, told ABC News. But they decided to fit him with special hearing aids that will enable him to learn spoken language. 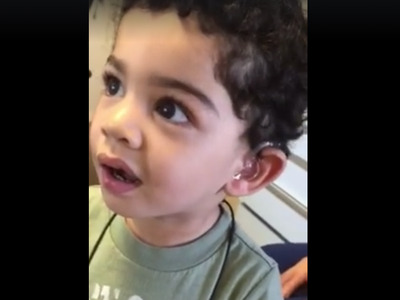 When Kaiden was fitted with those hearing aids last week, Orantes captured the toddler’s joyful reaction on video and posted it to Facebook. The clip has already been viewed 14,000 times. Orantes told ABC News that she hopes to someday get Kaiden a cochlear implant — a surgically implanted device that can help some deaf or hard-of-hearing people hear. Both hearing aids and cochlear implants are a controversial issue in the deaf community, where deafness is seen as a culture, not a disability. Many deaf and hard of hearing people maintain they don’t need to be “fixed” to become more like hearing people. But it’s clear that these technologies have the power to make a positive difference in many lives — including little Kaiden’s. Since he was fitted with his hearing aids, Kaiden has been playing with toy guitars and getting in touch with his musical side.